Bonito Campground is named for the Bonito Lava Flow which oozed across this high desert plain some 900 years ago. That river of liquid rock, now frozen forever, is just one of the many remnants of volcanic activity which lend an otherwordly appearance to this starkly beautiful place. Though the cinder cones, lava squeeze-ups, lava caves, and petrified rock bubbles that dot the landscape became inactive over a century ago, they all look as if they could have been spurting and spouting just yesterday. This area of recent volcanic activity is so unique that much of it has been set aside as the Sunset Crater National Monument. The monument is located just beyond the boundaries of the campground. Also nearby is Wupatki National Monument. The centerpiece of this area is a four story masterpiece of Native American stone masonry. Construction of that stone-age condominium began in about A. D. 1120. At one time it contained as many as 100 rooms and housed as many as 125 people. Both Sunset Crater and Wupatki have visitor centers and feature self-guided as well as interpreter guided tours. The campsites are located in a stand of ponderosa pines struggling to establish a foothold in this hostile environment. All roads and spurs are paved. Camping: $25 per night, up to eight people with one vehicle. Second vehicle per night: $8 additional. Picnic/day use (10 a.m to 4 p.m.): $8 up to 5 people. Location: 18 miles northeast of Flagstaff, near Sunset Crater/Wupatki National Monument. Elevation is 6,900 feet. Access: Drive 12 miles northeast of Flagstaff on US 89. Turn east (right) on FR 545 (toward Sunset Crater) and drive 2 miles to Bonito Campground. Campground entrance is JUST BEFORE the entrance station of Sunset Crater National Monument. Only "street-legal" motorbikes/atv's may be used for entering or leaving campsite. 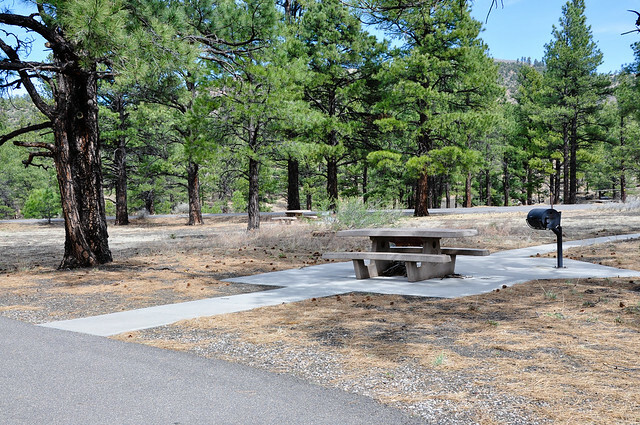 This campground is available for Picnic/day use (10 a.m to 4 p.m.) for a fee of $9.00 up to 5 people.